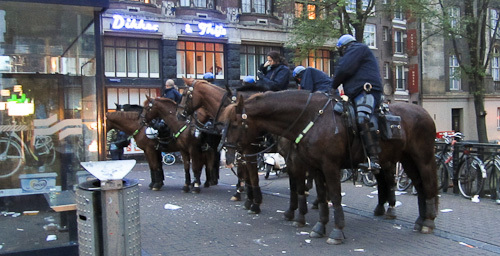 After the crowd at our new favorite pub dispersed, we made our way to Dam Square. We had about an hour to kill before Katherine and Anita arrived. 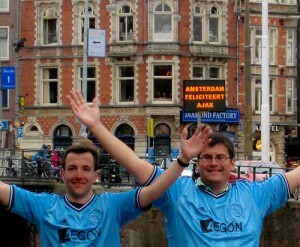 Of course, we set out in search of Ajax shirts for Will and me. 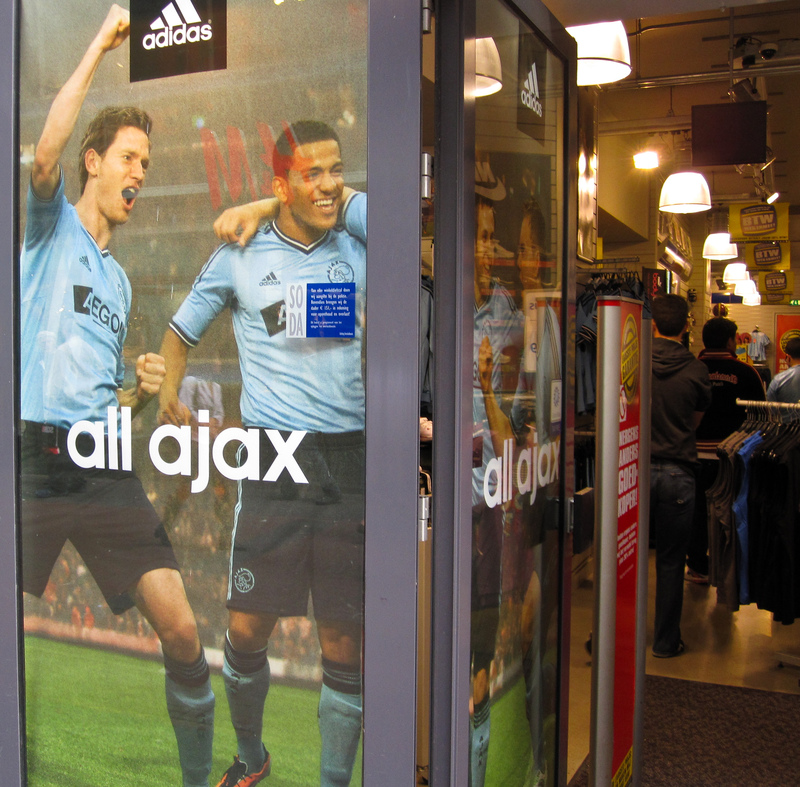 We walked to a Foot Locker and asked if they had Ajax shirts. The store employee at the front, basically a bouncer, shook his head and pointed to Aktie Sport down the street. 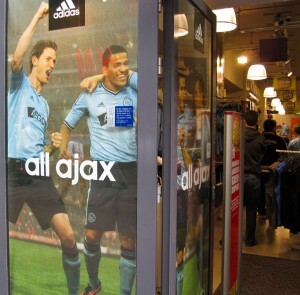 He clearly did not want drunk Ajax fans in his store. In Aktie Sports, I saw the blue “change” jersey, but not the red and white shirts that the team had worn during the game and that eighty percent of the fans were wearing that day. We asked the helpful staff whether they had the home shirts. The young men said that Adidas had not yet released the home shirts for the following season, and that the prior season’s shirts were no longer on sale. We both decided that a blue shirt bought in Amsterdam would be better than a red and white one bought over the internet. While trying on shirts for size, I thought that the large shirt was too big for me. I asked the two guys helping us if they had any mediums left. They looked at each other for a moment. The smaller guy sighed, and then took off the Ajax shirt he was wearing. He handed it to me. He looked so dejected. Laurie suspected that he was told that he could keep the shirt if he was still wearing it at the end of the day. 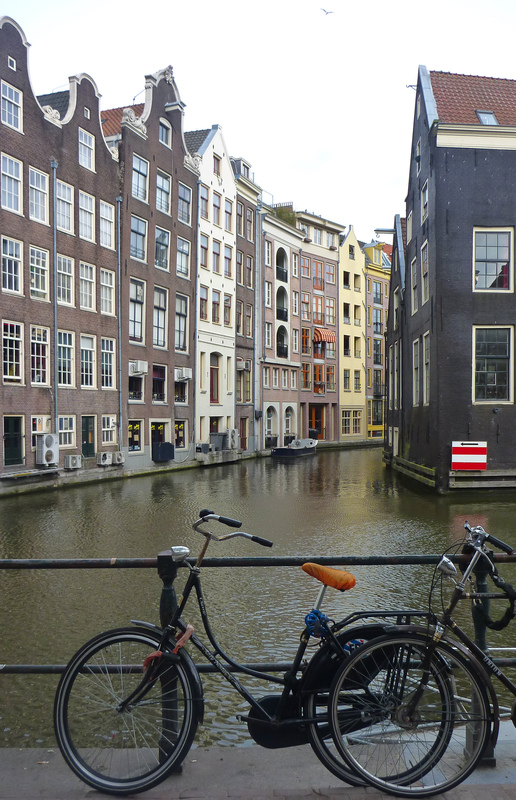 The poor Amsterdammer was good-natured about the whole situation, and we appreciated his help. After Aktie, we wandered around the outskirts of the red light district for the next half hour. 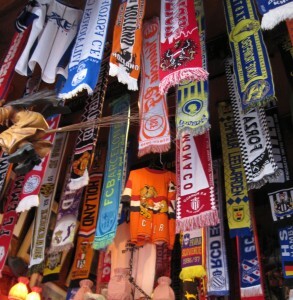 At one street corner, a man yelled “Kampions” every time a new person came into his view. 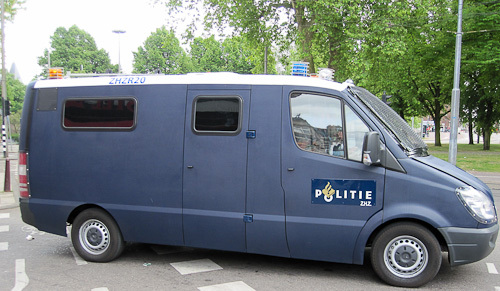 Further along, we saw a man in an Ajax shirt leaving a prostitute’s room, probably after celebrating the victory. We stopped for a moment in Will’s preferred red-light district watering hole — can you spot the Ajax scarf? He said, “No, Dutch.” He paused for a moment, and then said, “Go to Museumplein if you want to party.” Will guessed that we were being led astray, but I had another thought. I suddenly realized why there was a stage in Museumplein, when Anita, Katherine and I visited the Van Gogh museum. That was the location for the rally for the new Lands Kampions, immediately after the game! We got official confirmation a little later — “huldiging” means award ceremony. 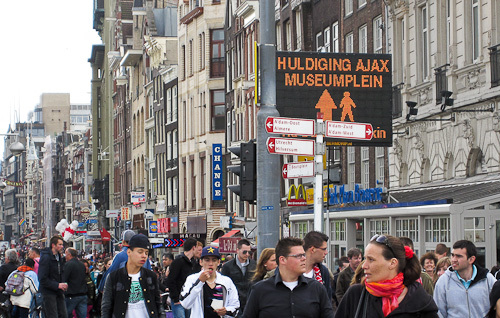 After we met up with Anita and Katherine, we toured the red-light district where half the fun was watching Ajax fans celebrate. We walked to Rembrandtplein to get a drink and some food. We passed a bar where the patrons were singing Queen’s “We are the Champions” in Dutch. Inside a calmer bar further down the square, we were able to watch the rally on the television — as well as an endless loop of game re-caps. You can recreate the experience in your own cube by watching Ajax TV in your browser: Championship Game Re-cap episode and Celebration episode. When I made a trip to the bathroom in our quiet bar, I met a new friend. We discussed our love for Ajax. He was wearing the shirt from 2004 when Ajax won their last Eredivisie title. He asked where I was from, and when I said Chicago, he said, “Hey hey hey, Al Capone!” and did a little dance. He insisted that I call the game football, not soccer. He predicted that the US will win the World Cup in ten years, although he was less impressed with Jozy Altidore than I am. 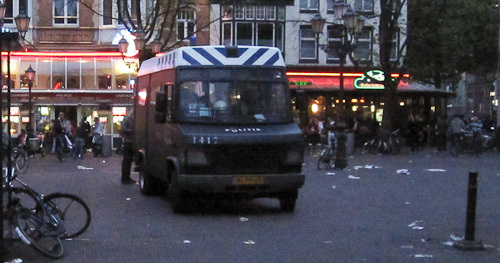 Riot police drove up and down the streets in armored vehicles. 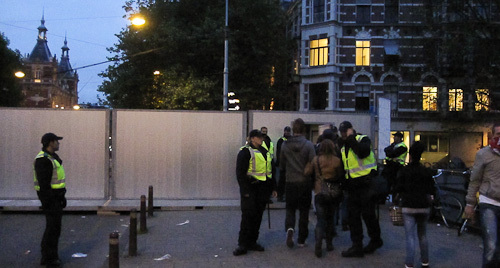 After crossing the Leidseplein, we saw that the walls from earlier in the day were now being used as a barrier to separate the Museumplein from the Leidseplein. We walked through a small door in the barrier to get to our hotel. 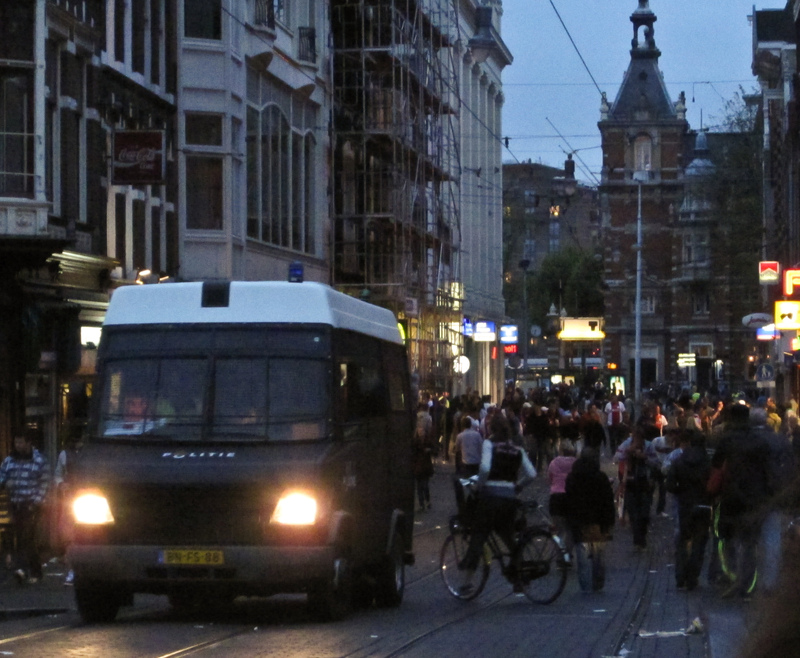 On the other side of the barrier, we counted at least seven riot vehicles and thirty police, prepared for a riot. The riot had not materialized, and it appeared that they were all having a snack at the food truck. While the police patrols made it feel a bit like an occupied territory, I did not think that the crowds were out of control. I never feared for my safety. After crossing the canal, we had a drink with a good view of the riot barrier and we watched the police for a while. When the police finally moved the barrier and started to drive away, we decided to head back to the hotel. 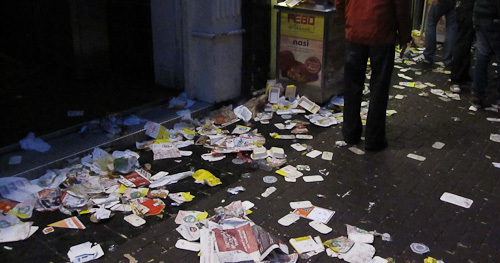 It had been a long day and we had just seen the Dutch Superbowl. Being with the Lands Kampions that Sunday was a football experience that this American will never forget. 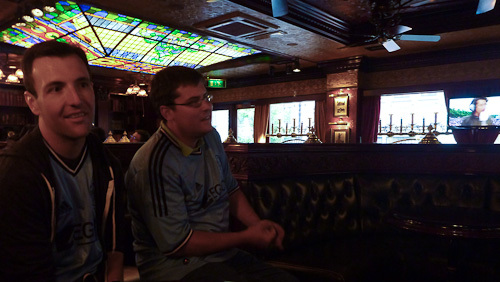 You can see the poor Amsterdammer in the background of the Aktie sport picture, looking longingly at his shirt. Great story, timeline, adjectives, adverbs and personal affinity with the locale and the locals. I like your use of the term “Riot”, which is instead of the American PC term “Crowd Control”.